As marketers, we know that the industry is ever changing. An effective strategy two years ago might be ancient today. For instance, data from social media sites like Facebook made a tsunami in the marketing industry. But those days are probably a thing of the past due to the social site’s own missteps—consumers are skeptical and regulation looms in the future. Today, consumers are cord-cutting, using ad-blockers, more skeptical on social media, and more cautious when sharing their email addresses and personal data, all while still spending more time on the internet than ever before. That last point is key to this discussion, since online marketing will continue to grow. As consumers are finding more ways to skirt traditional advertising, marketers must adjust their strategies accordingly. In recent years, the marketing industry as a whole has shifted toward more content-oriented strategies. Free forms of content, such as blogs, social media posts, advertisements on social media, and podcasts and other free advice-sharing mediums are of abundance. Content is exploding, and this explosion will not be extinguished any time soon. The rise of content is two-sided, especially for small businesses. 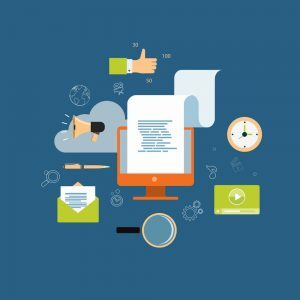 Blogs and social media strategies are relatively low-cost, but these low costs also mean that large corporations can employ an infantry of content strategies, and they absolutely have. This phenomenon has created an ocean of content for consumers. Small businesses must navigate this ocean with a canoe while large businesses travel in a yacht. Yup. The content style that has existed since the first cave paintings and humanity’s first language. Storytelling is back and is becoming the best way to bring your marketing efforts from the depths of the Mariana Trench into the forefront of the ocean of online content. With the tremendous amounts of free content floating around the internet, the way this content is crafted is important. The internet is fast-paced; advertisements that simply lay out facts, reviews and “reasons to buy our product” simply lack the attention-grabbing qualities that are the entire essence of storytelling. The simple construction of a well-told story is what grabs consumers’ attention. Its plot hooks consumers with an intriguing problem and pulls readers through until they discover the resolution. There’s a reason our “Home for the Weekend” campaign for Fremont Contract Carriers was so successful. The campaign told the story of a problem truck drivers frequently face, provided a conflict, tied in emotion, and concluded with a resolution. It gave its target demographic a solution to their problem—work for FCC. Whether your content provides a problem and solution to a demographic, or simply gives advice, both can be presented in a story-telling fashion. Maybe the content tells a data journey, where it came from and how it helped you succeed. It can tell the story of a customer’s purchasing journey, such as a problem along their way and how a business can remove this problem. Or it can even tell the story of your successful campaigns, which we employ at TM. The biggest point to make is that the content must seem less braggadocios and more relatable to the audience. The key to this is the voice of the content and its conclusion. Humanity as a whole has a major recency bias—it’s easier to remember what is most recent. This is always the case in how people react to the stock market. When it’s in a downturn, even for a short period, people react as if it’s the new recession; they forget that occasional downturns occur even in the largest of bull markets. This is what makes the conclusion and voice of the heartbeat of the story. If the content tells a success story, lead with a client’s problem, provide the resolution your company supplied, and conclude the story with how the client benefited and not with a tagline promoting your product. Whether it’s a video, blog, or podcast your audience will be engaged with a problem they likely face, they will see your companies solution, and see how your client benefited. No one thinks Batman brags when he saves Gotham. Viewers are presented with a problem Gotham faces, Batman appears, the people are safe once again. Place your target demographic in the client’s shoes facing a problem, not when they received your sales pitch. The next area the content should focus on is the order in which the meaty details are presented. Remember, you’re telling a story, not the news. Batman comics do not lead with Batman giving a slideshow presentation titled “How I Defeated The Joker.” DC writers let viewers discover the details their own! The same idea applies to marketing writers. Ditch the chronological order, throw away the pyramid, breaking-news style writing, and replace it with a well-structured story that pulls the reader to its conclusion. Even though marketing writers do not write fictional stories about a beloved superhero, potential clients are looking for a solution to their problem, not entertainment. If you can provide them with both, your marketing campaigns will soon be navigating the content ocean in a yacht, not that canoe.